I've had a busier than usual weekend. 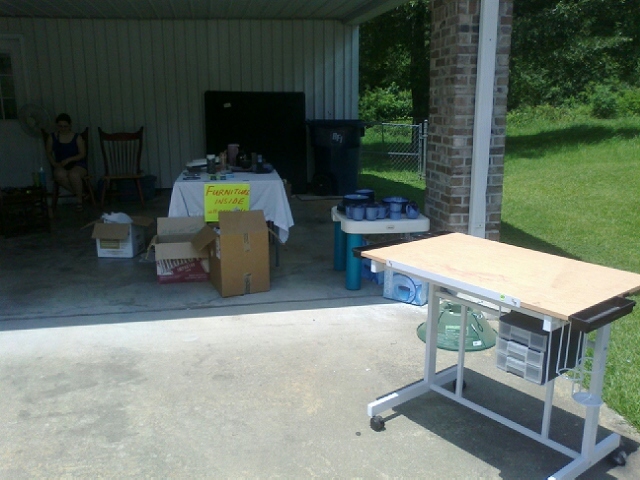 Friday morning, I went over to Anna's house to help her out with her 2-day moving sale. Since she's moving all the way to Texas (so far northwest she'll practically be in New Mexico), she's having to severely condense her belongings to as few things as possible. 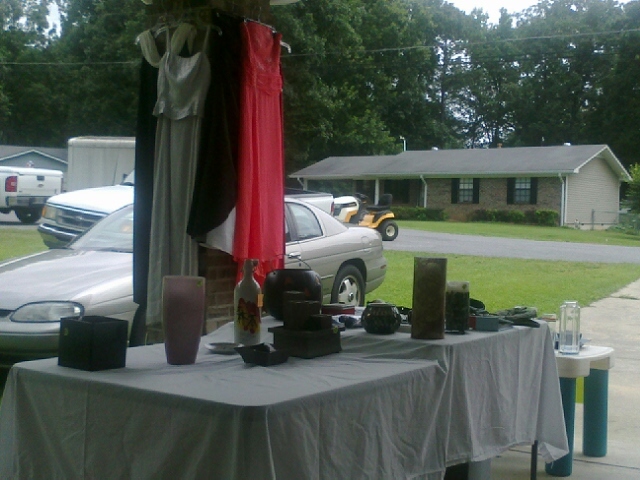 When I saw how much cash she was making off of old junk she was going to throw away or donate to the thrift store, I asked if I could bring some of my own things the next day. I figured it'd be good for both of us, since the more things we had sitting around, the more "impressive" the sale would look, and the more people would stop. 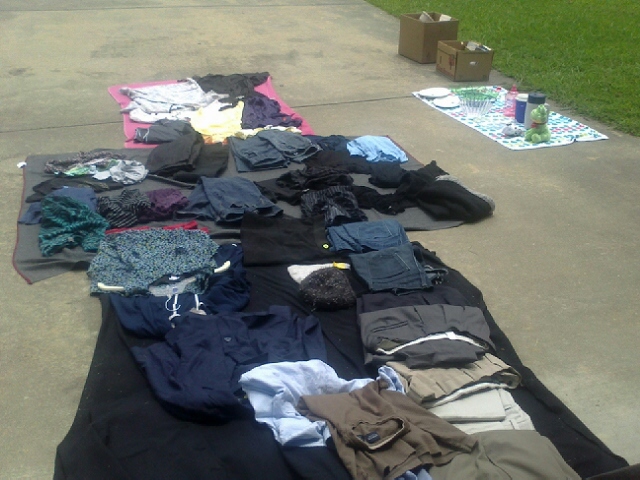 So I spent Friday afternoon and evening rummaging through closets and drawers, looking for anything I could sell. Anna ended up making well over $200 on both days combined, and I made about $100. On junk. 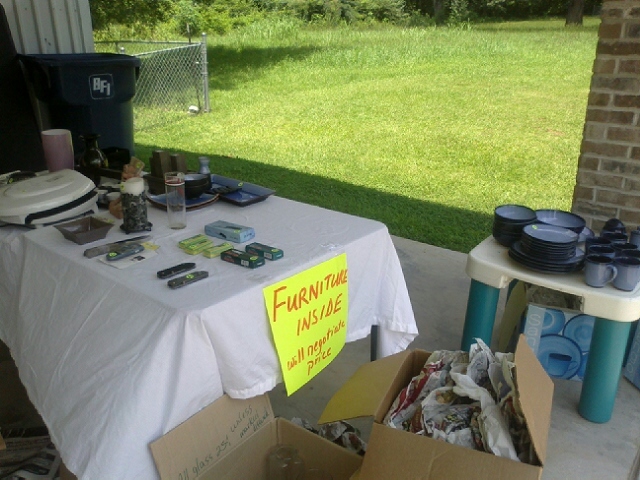 (Seriously, I almost felt bad for selling some items to people.) But I really need that extra money, so I was thrilled! Sunday, I went back to the church we visited last week, but this time, I went alone. And it was so much more crowded this week! I had to ride around forever to find a parking spot, and when I did find one, it was in a third parking lot waaaay away from the church. So far that they have a little shuttle to take people to the front door. Normally, I would have refused the shuttle and just walked, because a ride alone with a complete stranger has awkward written all over it. But I didn't. I hopped in and made small-talk all the way to the door. I didn't enjoy the service as much as last time. Of course (eyeroll). They didn't have a real worship service or a sermon; they just recapped their week-long Bible school and did a baby dedication ceremony. So, I hate to say it, but I kind of felt like I'd wasted my time. BUT I'M NOT GIVING UP. I'm so sick of going to a church once, really liking it, then going back a second time and judgmentally picking it all apart. I will give this church another try. After church, I did something I've never done before. I was craving Chinese, so I went to a popular Chinese buffet. Alone. Now, let me remind you that, here in Alabama at least, Sunday after church is just as busy and popular of a public social time as Friday night. I mean, the wait at Cracker Barrel gets to be like 2 hours long. So at this buffet, there were tons of couples, groups of friends, families, and even a youth group, all dining together in their Sunday best. And there was me. Alone. I felt really awkward, but I didn't leave. I didn't even play with my phone or pretend to text. I just ate and tried to feel comfortable in my solitude. But truthfully, I just felt very sad. And maybe it was just me being paranoid, but I felt like some of the people with whom I made eye contact were looking at me a little sympathetically, almost like they felt sorry for me. I dunno. When you're scared, your mind can do some reality-warping, I suppose. In other news, I faced another fear and joined the local running club! I've been wanting to join, because they have group runs, group social outings, lots of cool ways to meet people with similar interests. 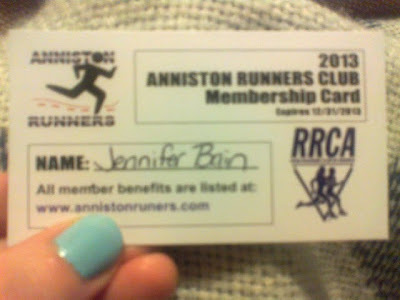 Plus, the membership card has several restaurant discounts on the back, and a special code to use when you register for races that knocks a few dollars off of the price! The only thing that has kept me from joining is that negative voice in my head that kept saying, "Those people will judge you. You're still overweight. You can barely run a mile in 10 minutes, and after that, you have to take walking breaks. What kind of 'runner' is that?" Well, I finally just told that voice to shut up, and I joined. For today's scary thing, I did something very frightening. Really, I'm pretty surprised I did it. Our community UCP center does an annual telethon to raise money for children and adults with developmental disabilities. This telethon lasts for two days, airs on our local cable station, and features hours of local entertainment. I found the contact info and sent an e-mail to the event coordinator. I told her I sing and play guitar, and that I'm interested in participating in the entertainment. No response yet. I'm secretly hoping she'll say, "Thank you for your interest, but I am sorry to inform you that all performance slots have been filled." This was one of those why am I doing this? Why? WHY? things that I brought entirely on myself. Oh well. Too late now! How about you? Did you do any scary or uncomfortable new things this weekend? Or do you have any plans like that for this upcoming week? Wow. You've accomplished a lot! Congrats on making $100.. you know what they always say, "One man's trash is another man's treasure!" I sometimes eat alone. I used to be paranoid about it because I thought people were watching me, but I got over it eventually. It's not too bad. Most people are so busy paying attention to their food and who they're with that they don't notice the people eating alone. I hope you hear back from the event coordinator soon! Good luck! YAY for joining the running club!! I am excited for you, that is so great. Maybe you'll meet some awesome people, too :) I've actually considered joining our local running club... but I'm a pathetic runner, I can't even do a mile! So I think I need to get a little in shape first haha. Dang, girl! Look at you being all fearless! You are my hero, haha! Seriously that is so cool, and I hope that lady gladly accepts your offer to entertain :P That is too great. Hey, thanks for commenting! You made a good point about eating alone; most people ARE too busy paying attention to their own food/company to notice. I think it's all in my head! 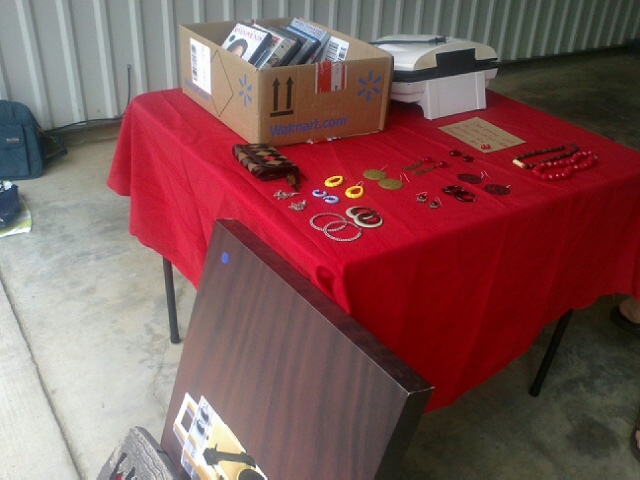 Yes, it amused me so much to see people picking up my random old items and considering whether or not to buy them! I also really enjoyed meeting all the people that stopped. Very interesting. Thanks for your well-wishes and encouragement, especially regarding the church search (that rhymed; sounds like a reality show. The Church Search.) I'm so glad you've found a place to get involved! That is so, so important! I hope your week is going great too! I am so proud of all the scary stuff you've been tackling! I know it's gonna pay off and you'll be so glad you did!